Home / Worth writing about… / All / Thoughtful article on the Craftivist Collective in HUCK magazine. Issue out now. Thoughtful article on the Craftivist Collective in HUCK magazine. Issue out now. 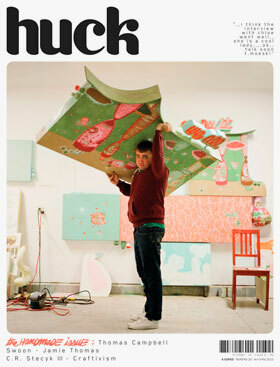 25 Apr Thoughtful article on the Craftivist Collective in HUCK magazine. Issue out now. As if being featured in the March issue of Oh Comely magazine (a firm favourite with London craftivists Margo, Sarah C, Sarah H and Hannah K) wasn’t enough, there is a great article on the Craftivist Collective in the latest issue of HUCK magazine. HUCK is a bi-montly lifestyle magazine rooted in surf, skate and snowboarding, which reports on “social movements, emerging scenes and new thoughts and ideas that are having an impact on the world”. It also happens to be one of Sarah C’s top 3 magazines, which for a self-confessed magazine and zine geek is a pretty big deal! The article details the rise of craftivism as a vibrant and ever expanding social movement. Article author Shannon Denny visited one on the Craftivist Collective’s monthly stitch-ins at the Royal Festival Hall, London and her piece really conveys the lively buzz and community feel generated at these meetings, as well as the diverse discussions and projects that come out of them. It also mentions our friend and fellow craftivist, Carrie Reichardt, whose project ‘Hankies for Hope’ has drawn inspiration from the Craftivist Collective’s ‘Don’t blow It’ project. You can read the full article in HUCK here. Also in this issue, a competition to win a gorgeous piece of textile wall art by artist Thomas Campbell. All you have to do is send the lovely people at HUCK a postcard from your home town to be in with a chance to win. The closing date is 1st June 2012.